English description | SUb bleibt! First a couple words about us: SUb is a self-governed club project on Kaiser-Franz-Josef-Kai street in Graz. All decisions regarding the collective are made in the weekly plenum. The low-threshold, diverse program ranges from concerts, parties, readings, workshops to discussion events. About thousand artists of all genres and corners of this world have appeared on the stage of the colorful house at the Mur river in the course of the last two decades. This was only possible because many beautiful people invested and invest their precious free-time, without any financial remuneration. In general, everyone is welcome to participate in our club but we don’t accept discriminating behavior or ideologies. SUb is exclusively financed through donations and minimal membership fee. We don’t receive any funding from the state budget, nor do we accept money from private companies or patronizing third-party individuals. This is also the reason why our collective cannot finance the proposed renovations on its own. SUb should remain a low-threshold space for local and international artists and should offer everyone a rich cultural program. In the light of the ever more diminishing social climate that is leaning towards authoritarianism, without sustainable vision or empathy, SUb remains an important place of counter culture. The cooperation and exchange of ideas in this collective clearly shows that a different – not neoliberal – society is possible. 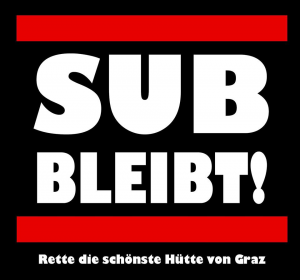 SUb represents an antithesis in the mainstream society; with its dog eat dog mentality. Solidarity instead of concurrency! Financially: You can support us by sending us some of your hard earned savings via our crowdfunding campaign or via bank transaction (Kulturverein Comunikai, IBAN: AT54 3800 0000 0504 2114, BIC: RZSTAT2G). Merci, a place on the DIY-Olympus is reserved for you! In case you organize gigs/parties in other cities: we are very happy about Solidarity events, bars, shots etc.